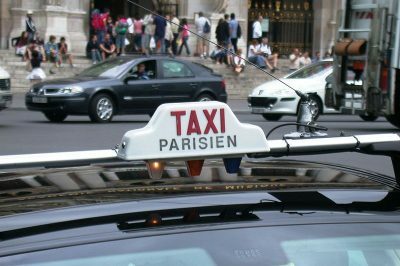 It may be just a few hundred feet away from the Louvre, the buzzing epicenter of tourism in the French capital. It may house a Michelin-starred restaurant, opulent boutiques, centuries-old theatres, covered passageways and lush gardens punctuated with sculptures. Somehow, though, Paris’ Palais Royal feels oddly removed from the intense noise and human traffic that’s a near-constant at the Louvre-Tuileries, just a couple of blocks southward. It can be a pocket of peace, offering precious space to breathe, amble and contemplate. At least during some periods of the year. For this and many other reasons, it’s one of my favorite spots in the city center to perch, window-shop and catch a break. Here’s why I think it merits your time, too. 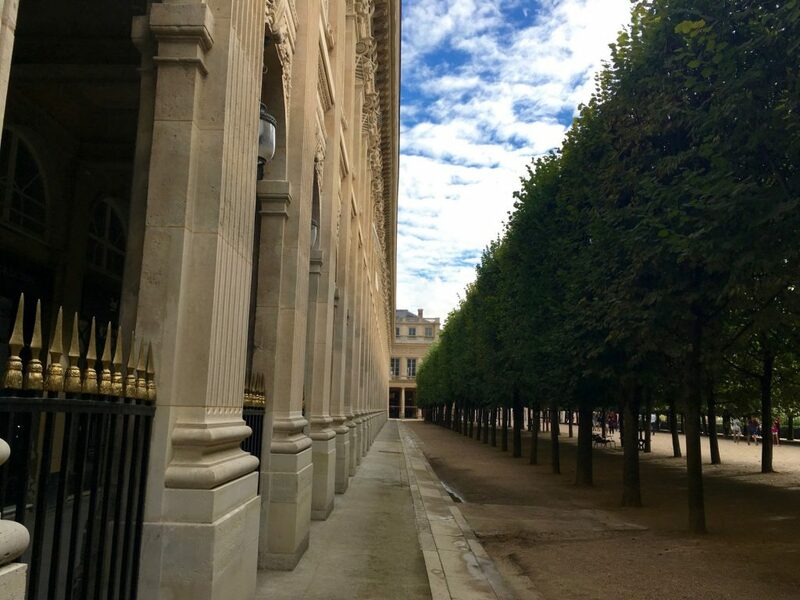 The Palais Royal has, as you might have easily guessed, a long royal history. It was built by the Cardinal Richelieu in 1628, then passed on to King Louis XIII in 1636. 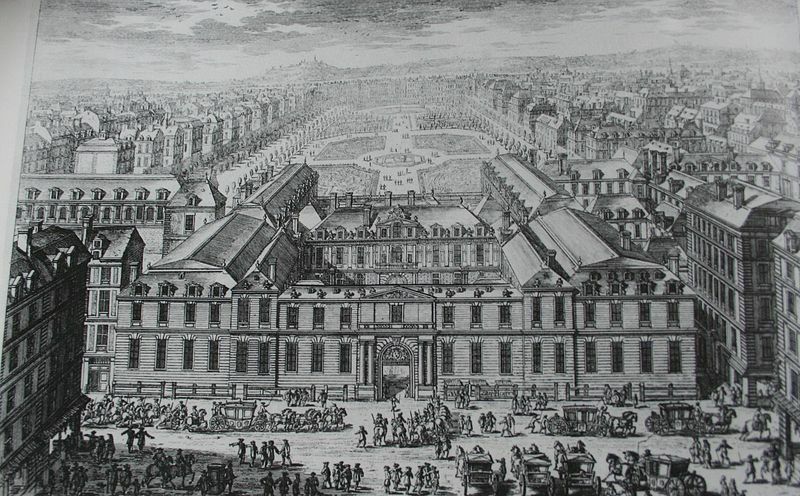 During the mid-17th-century period of revolt and civil war known as “La Fronde”, the child King Louis XIV lived at the palace, which officially became the Palais Royal. This was, of course, before the “Sun King” established absolutist rule over France, moving to the much-larger and opulent Palace at Versailles. The renaming and repurposing of the residence didn’t stop there. In 1692, the Duke Philippe d’Orléans was given ownership of the Palais, which for a time became the Palais d’Orléans. And it was only around 1780 that the royal Domain was expanded to incorporate a central garden surrounded by partly covered passageways, or galeries, supported by corinthian-style pillars. These were designed to accommodate a new, wealthy Parisian bourgeoisie. Here, as the photo above suggests, the city’s socialite and intellectual classes lounged in cafés, ambled through gardens and galeries, dined in fine restaurants and bet their fortunes in gambling houses that have long since closed. The Palais was also known as a site of “libértinage”, where sexual adventures and affairs could be enjoyed with discretion and impunity. Prostitution was common on the grounds, until it was explicitly banned during the mid-19th century. 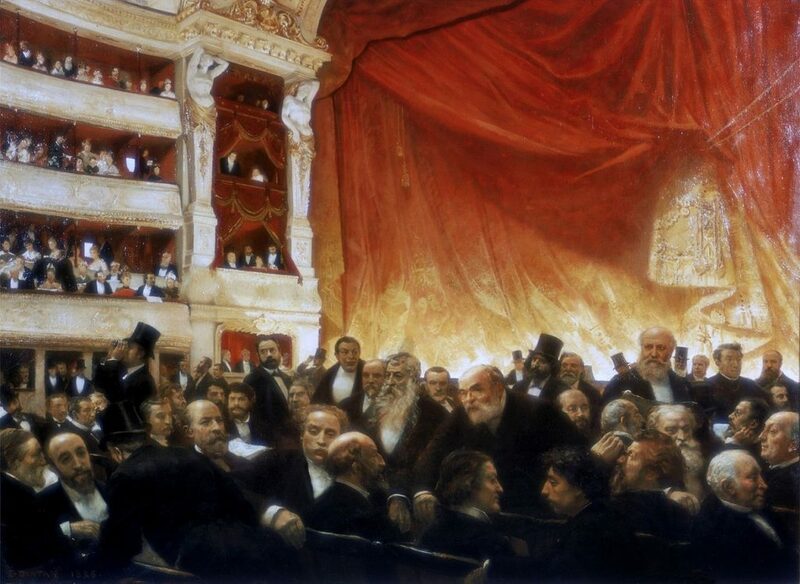 Edouard Dantan, “Between Acts at the Comédie Francaise on opening night”, 1885. Public domain. 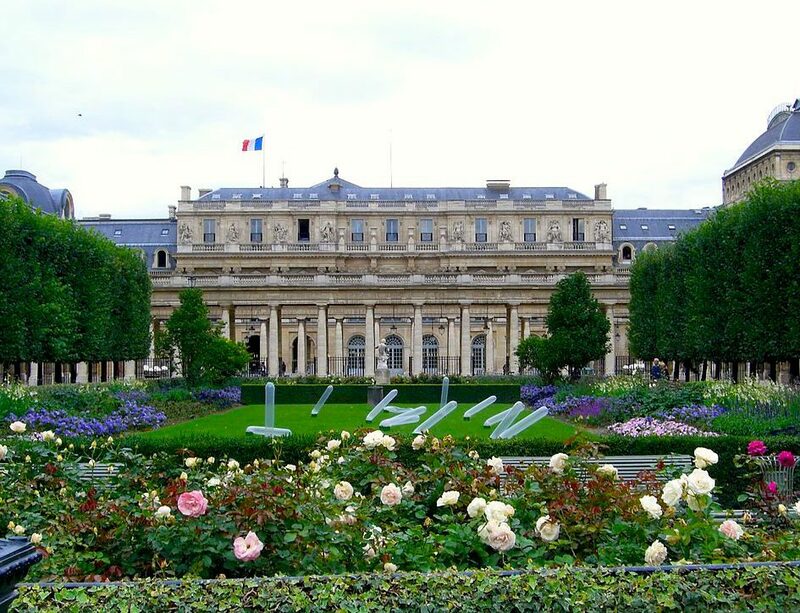 From the early 1870s and following revolutions and empires, attacks from violent mobs and damaging acts of arson, the Palais Royal was finally taken over by the French government. It continues in that role today, as the site of the State Council, Constitutional Council and Ministry of Culture. Classical theatres have long stood here, and still do. The Cardinal Richelieu had a theatre here, which the celebrated French playwright Molière took over in 1660. The Paris Opera was once located in a wing of the Palace, but was burned down twice during the 18th century. 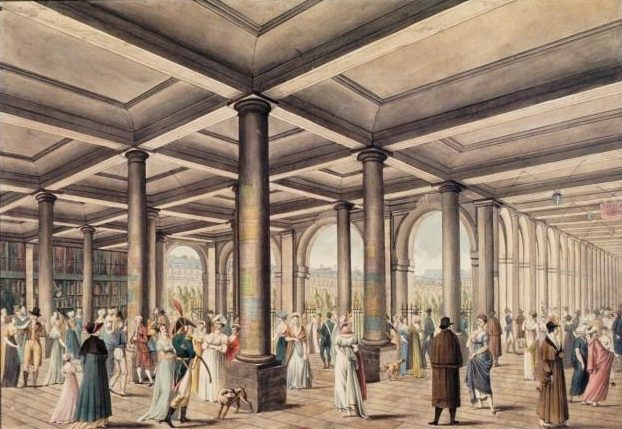 The Theatre du Palais-Royal, which still stands at the northwestern end of the complex, opened in 1790. And the current-day Comédie Francaise on Place Colette was inaugrated in 1799 (although the troupe itself was founded by Louis XIV in 1680). These days, as I mentioned earlier, the Palais is an alluring place to retreat to when you’re itching to escape the human swarm. One of the most striking aspects of the “Domaine” is its juxtaposing styles. 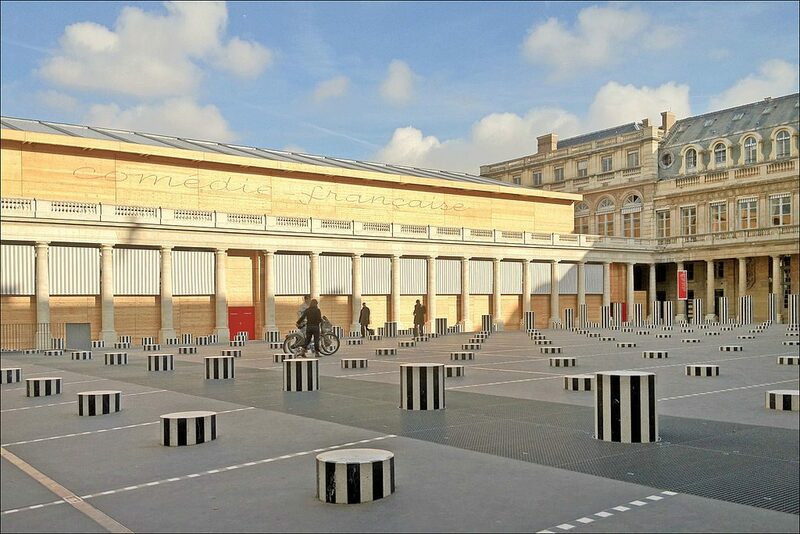 On one hand, the classical grandeur of the original buildings; on the other, the quirky 1986 installation (see below) from artist Daniel Buren, and featuring 280 black-and-white, striped columns in varying heights. Entitled “Les Deux Plateaux”, it’s nearly as controversial as the glass pyramid that stands in front of the nearby Louvre– but far lesser-known, and more subdued. 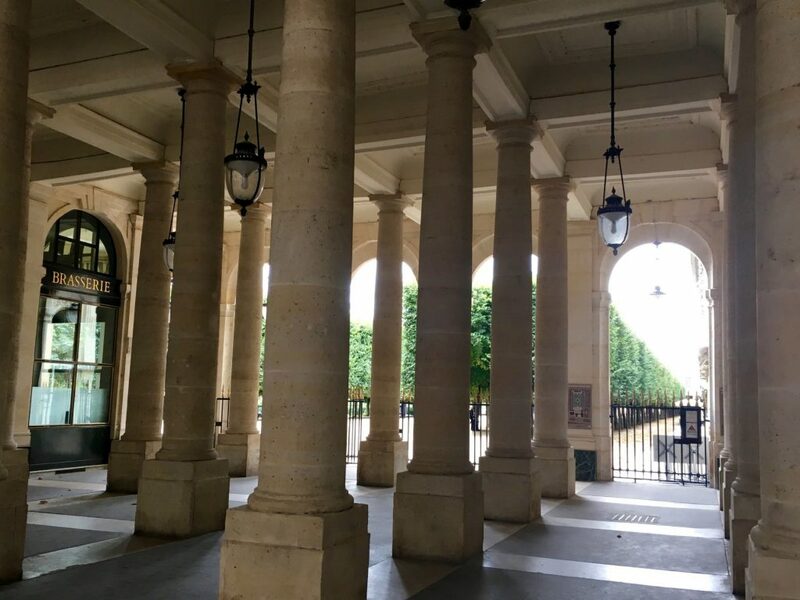 The Cours d’Honneur courtyard at the Palais Royal and rear of the Comedie Francaise, with Daniel Buren’s quirky striped columns. Jean-Paul Dalbera/Creative Commons 2.0 license. Moving into the central courtyard, it’s hard not to appreciate how the formal French garden’s clean, symmetrical lines and regal paths are softened and balanced by lush flowers, trees and shrubbery, as well as the occasional statue or water feature. It’s a lovely place for a spontaneous, simple picnic– but stick to the benches. Related: How & Where to Stage the Perfect Paris-Style Picnic? There’s something intimate about the garden, despite its central location. Somehow, it manages to reserve a corner of relative quiet for those curious enough to venture here. And while I thought I knew the place well– I once worked nearby and would often come to enjoy a lunch break with colleagues on sunnier days– I keep stumbling on details I’d never noticed. 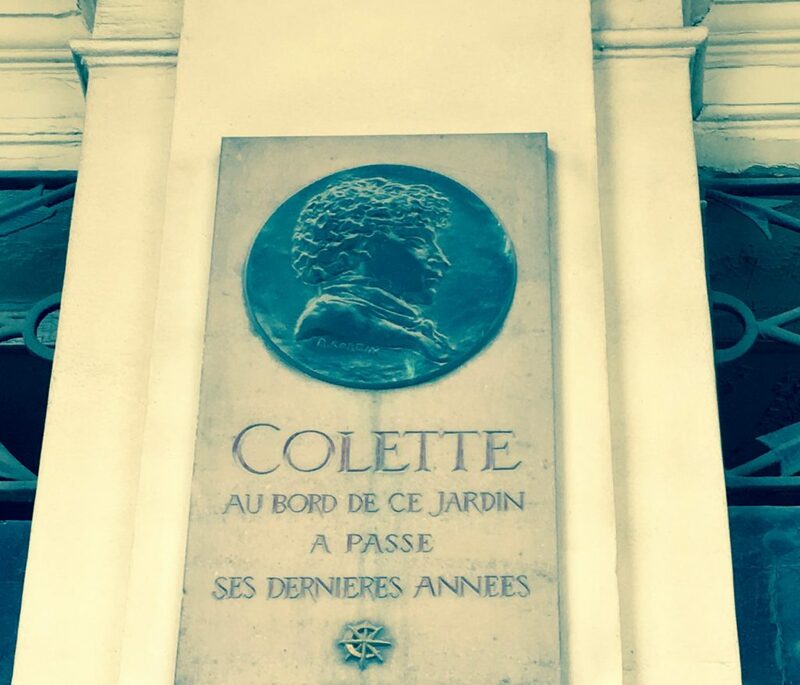 This plaque commemorating the French writer Colette, who lived on the square named after her, was one of them. The engraved plaque, discreetly gracing one of the pillars at the Palais, features a profile portrait of the writer and reads “Colette, overlooking this garden, passed her final years”. Even on a day when the gardens aren’t in bloom or the weather isn’t especially inviting, the Palais has its lures. Shopping, café lounging and restaurant-going are all possibilities. Options at the Palais range from gourmet, five-course meals at Michelin-starred restaurants to informal café fare. Le Grand Véfour, at the Palais’ northern end, holds three “macarons” from Michelin and is an obvious choice if you’re looking for a truly gastronomic table in the area. It also happens to be out of range for most of us. 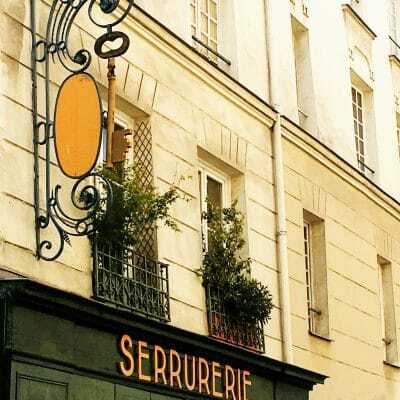 It’s in any case worth a look: the restaurant sits on the grounds of the former Café de Chartres, open during the 18th century and a favorite spot for discussion, arguments and manic coffee-drinking among artists and intellectuals of the period. 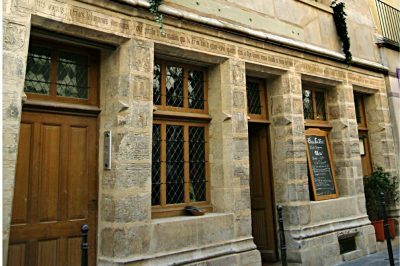 Luminaries who frequented the cafe include the satirist Voltaire and the poet and revolutionary Alphonse de Lamartine. 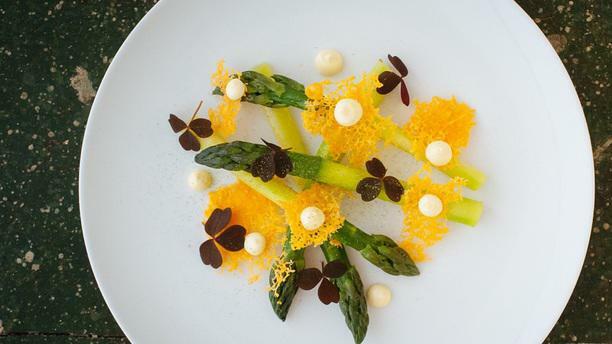 In the mid-range, and a table I thoroughly recommend, is Macéo, situated right across the road from the north entrance to the Palais and serving solid French and fusion cuisine, with many good options for vegetarians and an excellent wine list. For a casual coffee or snack, Café Kitsune (Jardin du, 51 Galerie de Montpensier) is an excellent choice. The coffee is of very decent quality and the atmosphere is generally pleasant. Most of the other bars and cafés in and around the Palais’ central garden area are pleasant spots for a break over a glass of wine or beer, especially when it’s warm enough to sit outside. 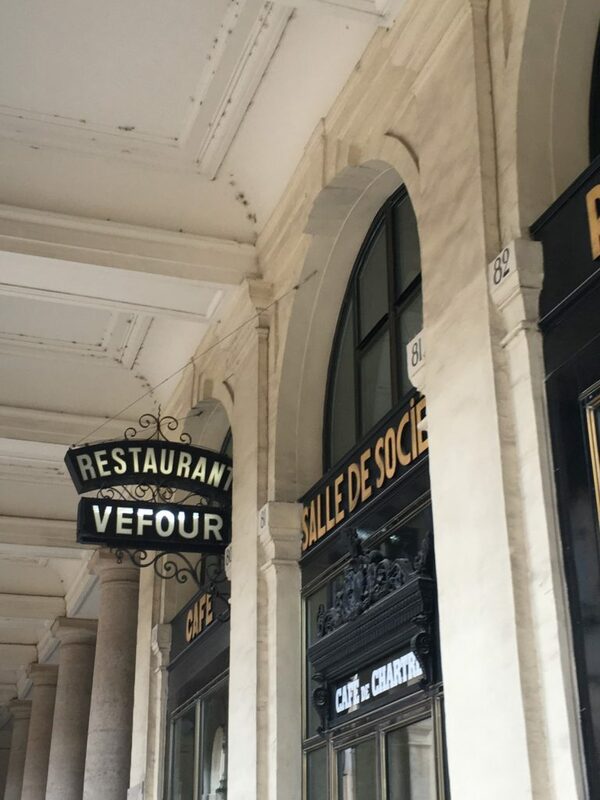 The galeries offer plenty of places ideal for indulging in a little lèche-vitrines (literally, “window-licking”, the more imaginative French term for “window-shopping”). Antique shops and art galleries, fashion & accessories from designers like Acne and Jerome Dreyfuss, and artisan jewelry workshops are among the boutiques of note clustered around the green central garden. My longtime and personal favorite is the flagship from niche perfumer Serge Lutens (142 Galerie de Valois, 75001). 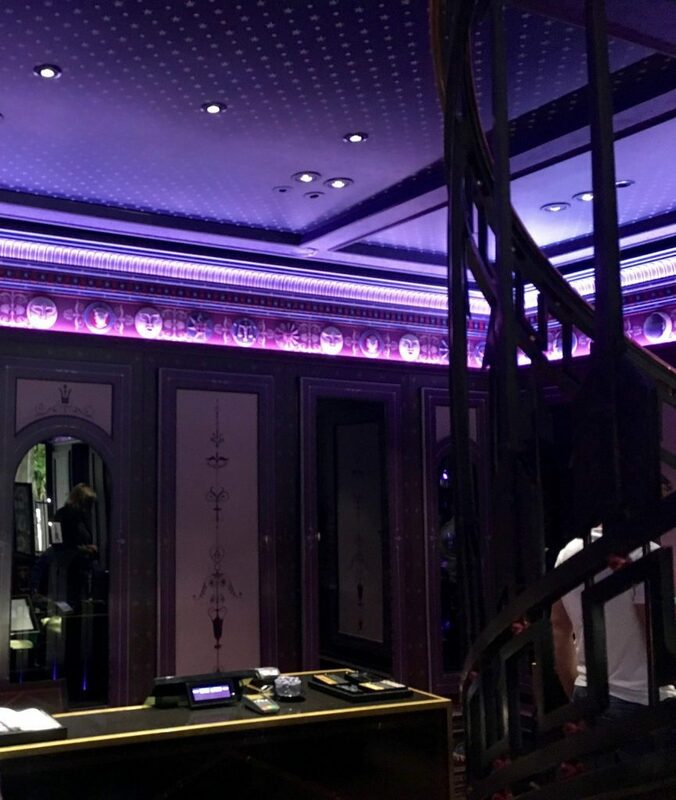 With its deep blue and violet interiors that seem out of some Belle-Epoque circus (or space-travel fantasy novel), the boutique rarely fails to lure me inside, for a whiff of some of the perfumer’s latest unisex creations. 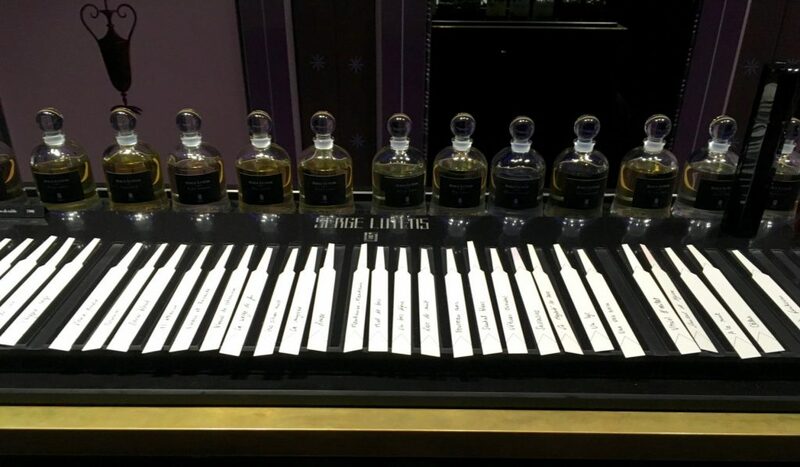 Perfume swatches at Serge Lutens. Image: Courtney Traub/All rights reserved. The Palais Royal is most easily accessed by getting off at Metro Palais Royal-Musée du Louvre and walking (less than five minutes). 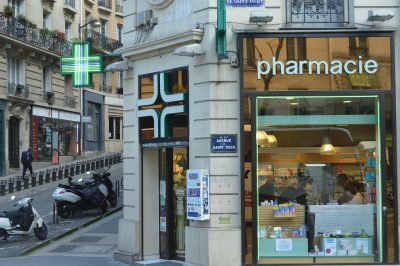 You can also get off at the Pyramides metro stop (lines 7 and 14) or even Etienne-Marcel if you’re exploring the adjoining Rue Montorgueil district (line 4)– something I highly recommend, by the way. 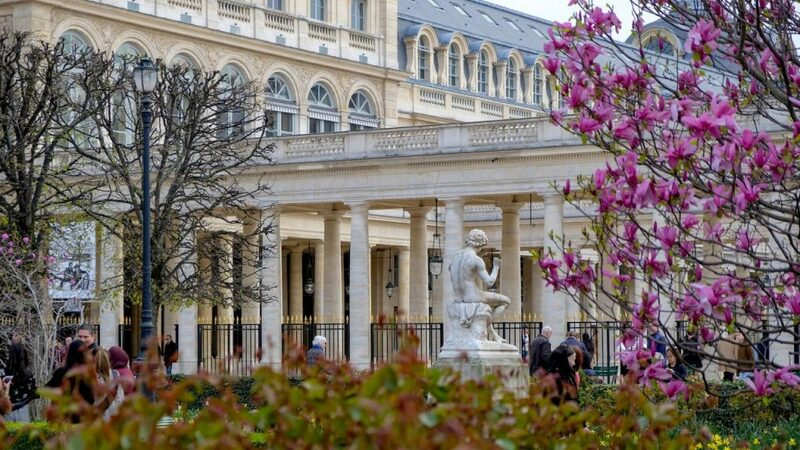 Entrance to the Palais Royal, gardens and galeries is free for all visitors. Opening Hours: From October to March, 8:00 am to 8:30 pm and April through September, 8:00 am to 10:30 pm. The grounds are open year-round, including on French public holidays. 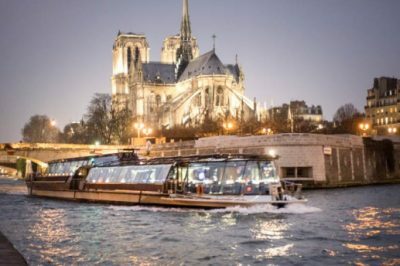 Paris Boat Tours & Cruises: Are They Worth Your Time?